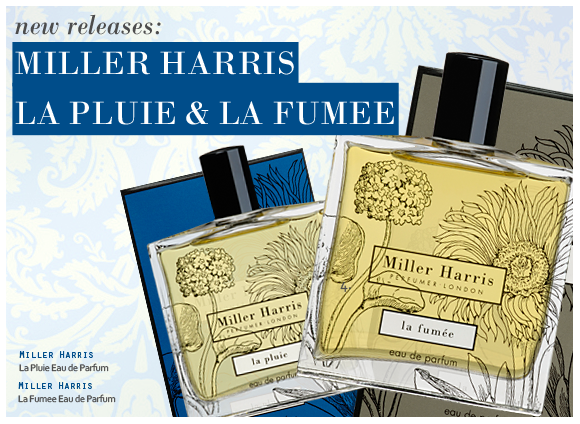 The latest release from Miller Harris is a double feature. This week has seen the launch of new fragrances La Pluie and La Fumee, two scents that couldn’t be more different to each other, but make for a truly lovely contrast. La Pluie, literally translated as Rain, is a luscious wet tropical scent that evokes the moodiness of inky blue-black stormclouds and the first drops of rain hitting the heated ground of a faraway paradise. La Fumee on the other hand is as arid and heady as its translated namesake, Smoke. The balminess of La Pluie is apparent straight away. The cool meeting of citruses and lavender with the warm and tropical floral heart of ylang ylang, cassie, jasmine and orange flower exhilarates the senses. A touch of wheat adds a slightly drier element to the composition that evokes the airiness of storm clouds. The drydown of vetiver bourbon and vanilla bourbon creates a wonderful creamy greenness that lends itself well to the abundance of flora. Where La Pluie is drenched with watery greenness, everything about La Fumee is dry and warm to the point of smouldering. There is a really addictive quality to this scent; though heady, it isn’t overpowering and it actually leans a little to the sweeter end of the smoky spectrum. The notes of La Fumee are equally as exotic as La Pluie, with cardamom from Guatemala, Egyptian cumin, elemi from the Philippines and incense from the Yemen making up the core composition. A deep and smoky heart of Moroccan cedarwood and incense captures the scent of smouldering embers wonderfully. This entry was posted on Friday, January 20th, 2012 at 3:00 pm and is filed under Fragrance, New products. You can follow any responses to this entry through the RSS 2.0 feed. You can skip to the end and leave a response. Pinging is currently not allowed.